Today was unusual. 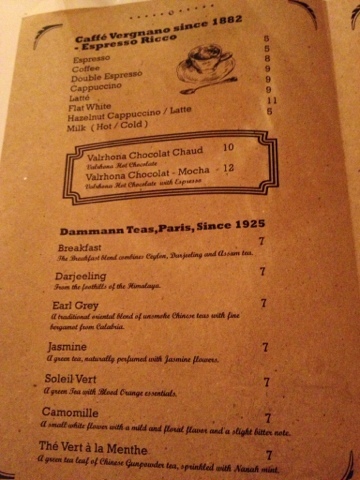 Would you believe that I started out my day with a breakfast meet-up with a friend of mine at Yeast Bistronomy -- had my chocolate croissant or what the French would fondly call Pain Au Chocolat. Then I ended my day with a dinner date with hubby ... where else? 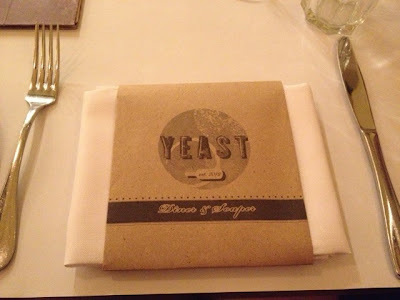 At Yeast Bistronomy again! Was literally there day and night. The next question would be ... was it worth it? 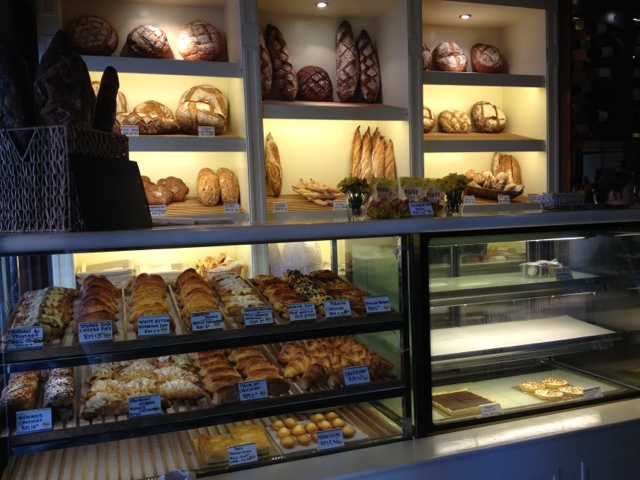 One of the things I miss the most about France is good bread. After several trips to Yeast, I would say they do decent bread that would make the French content and bread lovers like me happy. Some of it were hits-and-misses for us, while others are pretty decent and tasty. One of my favorites would be the pain au chocolat, while my daughter would take the nutella puff, and for daddy just plain croissant. This is the closest step you can get to French bread and pastries. Though there are indeed other bakeries out there who also make nice croissants and stuff, here you can get a whiff of the French ambience. 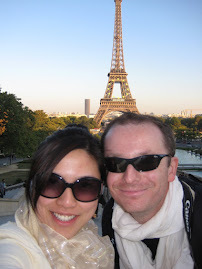 If you have been to France (and loved your trip and have fond memories of it), this will surely jolt you back into that moment. So this morning I had my pain au chocolat with some mint tea. The waiters were attentive enough and well trained. The bread was to my liking. My friend ordered the egg mayo croissant, which was another regular thing I used to order (when I was taking classes at Alliance Francaise Bangsar)... and she was satisfied and happy with it. So overall I would say if you come for breakfast, you will not be disappointed. My earlier review which was way back did reflect some disappointment, and I believe they have improved a lot over time. Morning service: 9/10 attentive waiters will come and get your order. Was easy to get their attention. 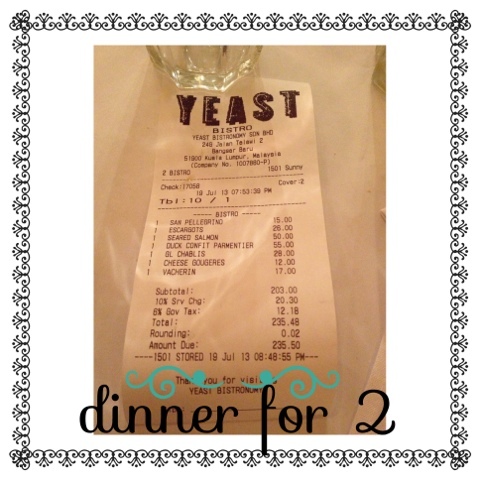 Despite several options presented, we chose to finally test out Yeast for their evening fare -- to see if it is up to par with the French bistros we so miss. The trip proved to be a good choice. First off, the ambience at night was so different from the morning. 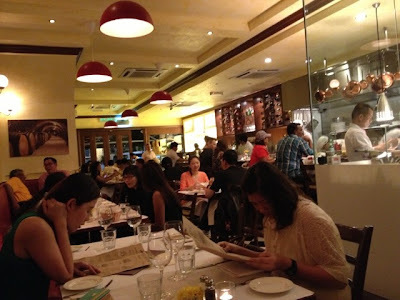 Maybe it was the lighting, or the extra-attentive waiters, or the music, or the smell of the place -- it really felt like a bistro in France. We walked in at a little before 8pm. We didn't have reservations, however, we were lucky as we were able to get a corner seat which was cozy. The place was half full at that time. Fast forward 30 minutes later, the place got so busy that it was packed. Literally all tables were full. The people just appeared out of nowhere. The place felt very alive and buzzing. 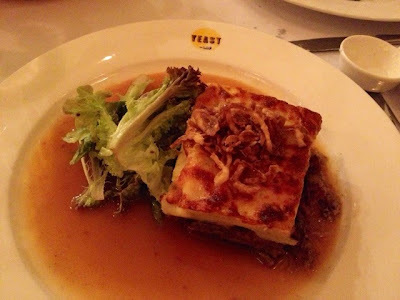 It brought back wonderful memories of restaurants that we have been to in Paris and Lyon. We have this super favorite restaurant in Paris called Le Timbre, which is a small and cozy restaurant with an open kitchen... at one point hubby brought up Le Timbre, because of some of the similarities (and also because of its contrast -- the whole Le Timbre was ran by 2 people only, one chef and one server; here in Yeast they had at least 5 servers walking the floor which is a luxury by French standards). 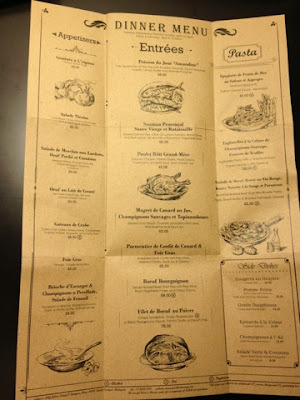 Another restaurant that came to mind was Paul Bocuse in Lyon, one of the three Michelin stars restaurant that we went to. The pots and pans that are hanging above the bar / cooking area of Yeast triggered that memory of our memorable dinner at Paul Bocuse. After our dinner at Paul Bocuse, they offered a tour of the kitchen, where I saw the beautiful golden copper kitchen pots and pans. 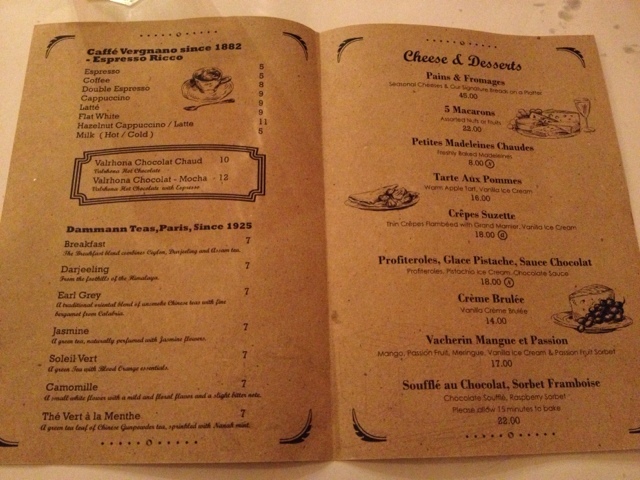 The menu style of Yeast also brings back nice memories of numerous bistros we have been to. 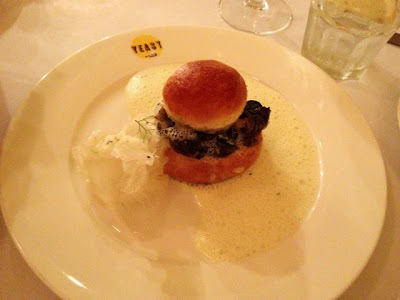 I cannot recall the names of the many bistros which we chanced upon in France...but Yeast certainly brings back memories of those nameless places that have piled up in my memory bank over the years. 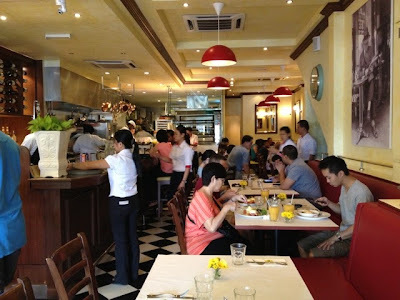 The main big difference would be the good service that we are getting at Yeast -- they have Filipino waiters who seem to be very well trained. 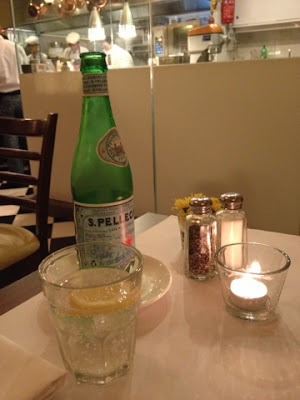 An example would be when I ordered San Pelligrino sparkling water, it came with a serving plate, the waiter served it and afterwards he promptly asked if we would like some lemon slices served with it. Impressive for Malaysian standards! 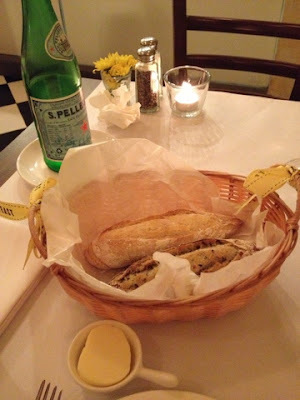 While waiting for the food, they also served up some nice baguette-like bread accompanied with salted butter. Yummy. We finished it! Three cheers for that, as authentic baguette is hard to come by in KL. The appetizer, main course and dessert that followed that were all equally satisfying. 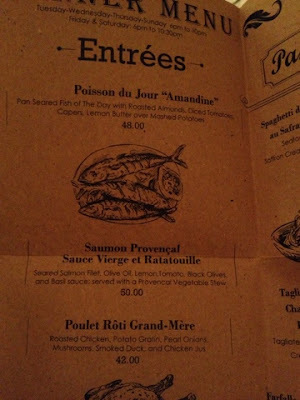 Hubby had an escargot appetizer which was interesting. I tried a small piece. 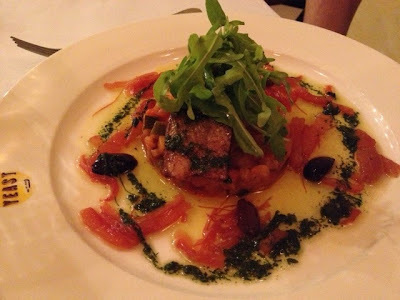 The seared salmon (Saumon Provencal) which hubby ordered was tasty (for him). I tried it and didn't like it that much simply because I could smell the "fishy" smell of the salmon. He didn't mind. I did. I would never over that for myself. My duck confit parmentier was superb. 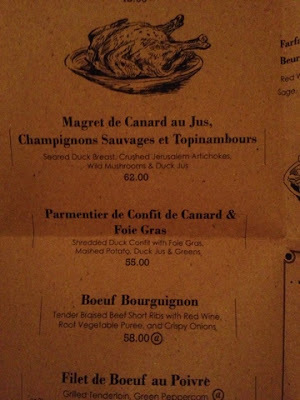 Killer (due to the foie gras that came with it). Highly recommended. Loved it. Though I would say it is better that this dish be shared -- it can be too rich at the end. Hubby did partake some of it. 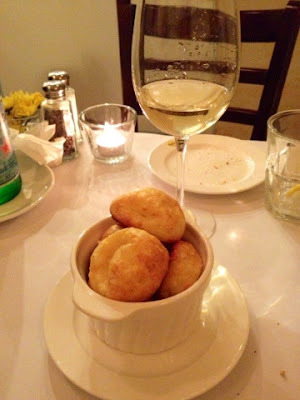 He also ordered some Cheese Gougeres on the side. It was my first time to see this. It is literally like cream puff pastry except that it is not a sweet kind of pastry -- it is filled with cheese and more of the savory type. It was freshly baked and smelled heavenly. To be eaten together with your dish -- so we had it with our main dishes. 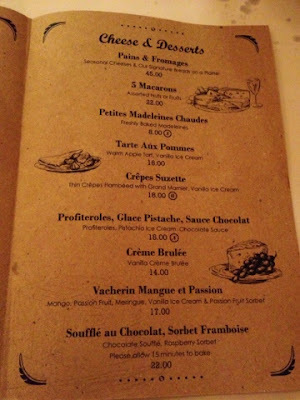 Hubby chose the dessert, my first time to try it: Vacherin. 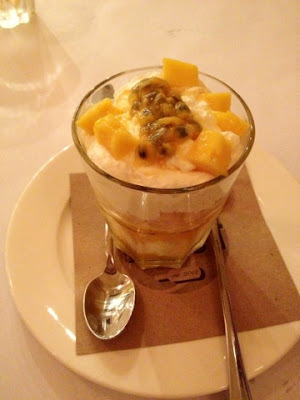 Layers of meringue, alternated layers with chantilly (whipped cream), sorbet, passion fruit & mango. Nice to be shared. We loved it. 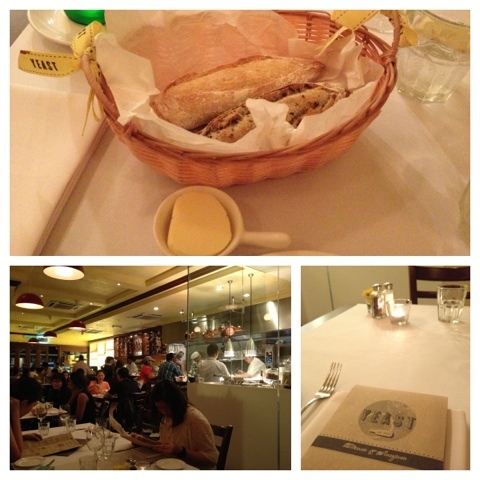 Ambience: 10/10 it will transport you back to Paris, that little French bistro that you have fond memories of. Food: 9/10 very authentic French food. Probably one of the best French cuisine at good price in KL. You are not killed by super high-ceiling prices (as what you would have to pay if you went to a hotel). Service: 10/10 I enjoyed the service of the Filipino waiters. Even the owner is much more friendlier than when we first visited long ago. I am impressed with the training of his waiters. Keep up the good work. We will surely go back to try the other dishes. Meanwhile, I will leave you with some photos and captions. Note: killer for your cholesterol! 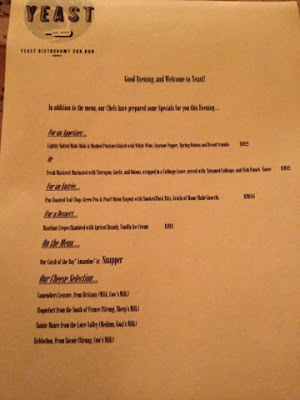 They had a special menu for the evening, which I guess they change often. I found the fonts of the prices too small. 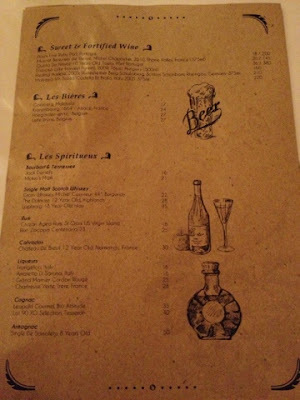 Note that there is a dish which they charge at RM 145! I thought it was RM45. Table setting when you arrive. 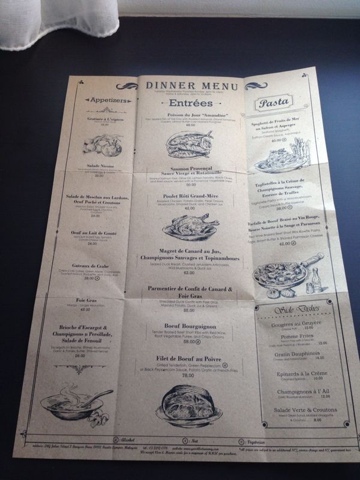 The folded brown thing is the menu. Charming! Sparkling water with lemon slices. Exactly how I like it. 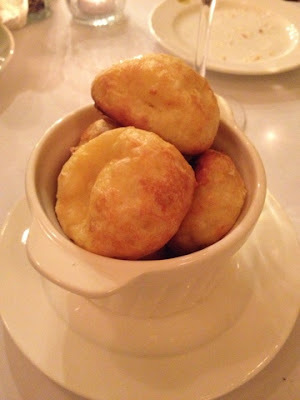 Cheese Gougeres - freshly baked and smelled so good! Wish I was not pregnant so I can enjoy it. Rarely can you find dessert wine by the glass! Vacherin dessert - worth trying! Layers of sorbet, meringue, fruits and chantilly!